Emails are deleted by users or lost due to technical problems. This causes the company to lose important data every day. Users need fast, comprehensive, and, increasingly, mobile access to their emails. IT managers need to ensure the security and availability of larger and larger quantities of data with limited technical and financial resources. In order to meet operational needs for litigation readiness and eDiscovery, for compliance reasons or end-user liability, companies must implement an email retention policy and ensure the centralized, tamperproof, and storage of all emails. The software creates 1:1 copies of all emails in a central email archive to ensure the security and availability of any amount of data for years to come. Users can still access their email using Microsoft Outlook, MailStore Web Access, or mobile devices such as tablets or smartphones, and search through them at breathtaking speed. Now available in version 8, MailStore Server has grown to become a global standard for email archiving in business following years of successful operation at more than 20,000 companies. Easy to install and 100-percent reliable in every situation. Businesses are faced with the challenge of meeting a growing number of regulations on email compliance, eDiscovery, and other legislation. By archiving all of their email, companies are also protected against general legal risks. MailStore makes it possible to use emails as evidence in court proceedings and improve how customer complaints are handled with more information available from the start. Emails can be lost due to technical errors, such as corrupt PST files, or deleted intentionally or accidentally by users. Users often delete all their mailboxes upon leaving a company. MailStore Server can eliminate such risks completely. Overloaded servers, increasing storage costs, and complex backup and restore processes place an enormous strain on IT departments and their budgets. MailStore Server permanently reduces these costs. It also shields against financial risks stemming from data loss or legal conflicts. Emails are an important and very extensive knowledge resource. 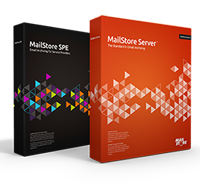 MailStore Server enables all users to access their emails easily and extremely fast, increasing productivity within the company. At many companies, emails are not stored on local email servers under the company’s control but on the servers of online service providers. This means that you have to trust the backup tools used by this company, and be sure that this company will be around in the future. By archiving all externallymanaged data, you can build on this trust through a simple and effective backup strategy. 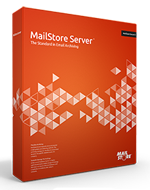 MailStore Server supports almost all popular email systems and archiving methods. Email can be archived from the mailboxes of email servers as well as from decentralized email clients or files. Furthermore, it is also possible to archive all email from a single company as soon as they are sent or received. Low one-time acquisition costs, minimal system requirements, and integrated storage technology, which means that no SQL server is required, even with large numbers of users. 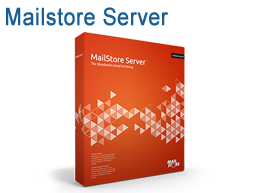 MailStore Server can be installed and running in a very short space of time. Emails can be deleted from the mail server’s mailboxes according to a rule-based process once they have been archived. This allows the workload of the server to be maintained at a consistently low level. Procedures such as transferring emails to PST files become redundant. With an email archiving solution in place, these issues simply go away. A client who chooses a cloud service for their email archive wants to know that the security, availability, and confidentiality of their business-critical information is guaranteed. As a result, MailStore has implemented an instance concept in MailStore Service Provider Edition. This provides end customers with their own self-contained MailStore instance which is operating independently of those belonging to other customers. The service provider that is using the web-based management console (or API) centrally manages these instances. The setup of new instances as well as the management of storage locations within the archive is included. The tasks running within an instance are handled by the archive administrator, including compliance-related settings as well as permissions management. Depending on the specific requirements, either the service provider or the end customer can perform this role. The special feature: Only the archive administrator has access to the emails archived within the instance. This feature can be used to implement business models, if requested, where the service provider does not have direct access to the end customers’ data. Application Scenario "Single Server Operation"
Application Scenario "Multi Server Operation"
When choosing multi server operation, the individual components of MailStore Service Provider Edition (instance hosts and client access servers) are run on different servers and managed and monitored centrally via the management server. Each end customer is provided with his or her own independent archive instance and it is run separately from those belonging to other customers. As a service provider, you can create and centrally manage as many instances as you need. Specific administrative tasks may be carried out by the end customer, upon request. This way, it is possible to create models in which the service provider does not have direct access to the data stored in the instances of the end customers (for example, archived emails and users that have been created). 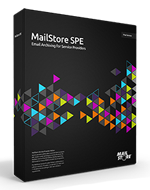 You can also use the MailStore SPE to implement private cloud installations. 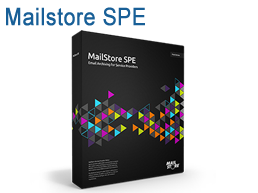 Service providers will be able to broaden their portfolio and offer their customers all the advantages of modern email archiving as a service thanks to the MailStore Service Provider Edition (SPE). This video shows you how you can archive email from a single mailbox of an email server.